This is a beautiful display of autumn vegetables to serve as a first course before grilled or roasted meat or birds, or as part of a holiday buffet. 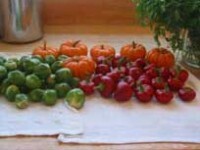 The trick is to buy the little red peppers and baby pumpkins when you find them in the market; fill them and bake them separately; and serve them on a bed of hashed and wilted brussel sprouts. The whole presentation can be made ahead and reheated before serving. 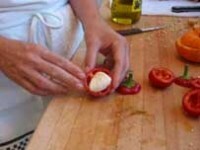 Although the recipe calls for filling the peppers with tomatoes, you can simply stuff them with fresh Mozzarella cheese with a little salt and olive oil. 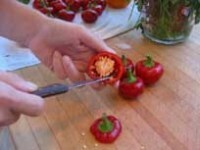 If you can’t find the little red peppers, just cut sweet bell peppers to make little bowls. 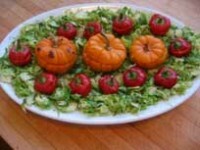 Cut off the top of each pumpkin and lay them on a lightly oiled baking pan. Remove the seeds and fiber with a small spoon. Sprinkle the insides with salt and pepper, and fill with Mascarpone mixed with fresh herbs. 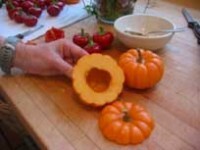 Bake in a preheated 325 degree oven for 1 hour, or until the pumpkins are tender when pierced with a fork. 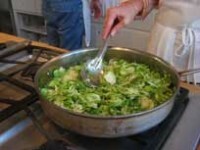 Cut the stem from the brusel sprouts and halve each one lengthwise. Slice each half into thin slices, about 1/8 inch thick, and toss with the lemon juice in a large bowl. Heat the butter or olive oil in a saute oan over high heat, stir in the hashed sprouts, saute over medium high heat until softened and golden. Add salt and pepper to taste. Serve on warm plates with a stuffed pimento in the center of each or on a large serving platter with stuffed baby pumpkins surrounded by stuffed peppers.